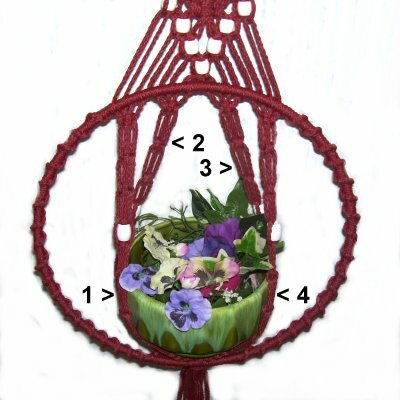 Description: The Diamond Drop Planter is unique in the fact that it can be used as a wall hanging, or can dangle freely like a regular plant hanger. Beads and knots are used to form attractive diamond shapes above the large ring. There is no real cradle, just four "straps" that fit around the pot, which rests on the ring itself. 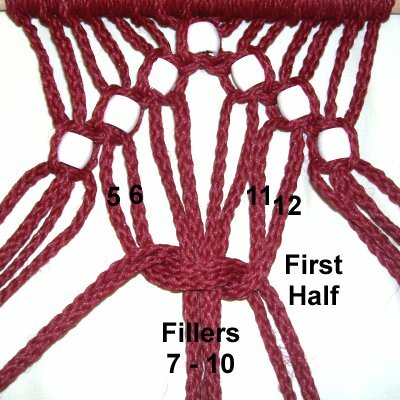 This Macrame pattern is written for two sizes. The small size is for plant pots up to 6 inches wide. The finished height is approximately 36 inches, not including the fringe at the bottom. The large size will be over 45 inches long. Use this size for plant pots wider than 6 inches. 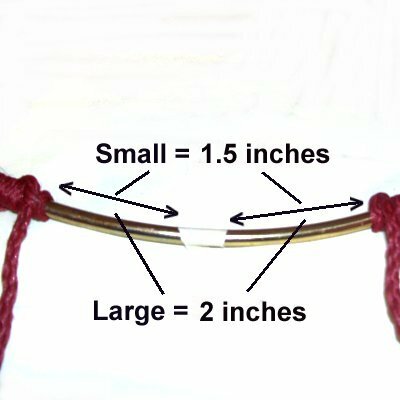 Small Size: Cut 8 cords, each 7 yards long. Cut 2 cords, 30 inches long. 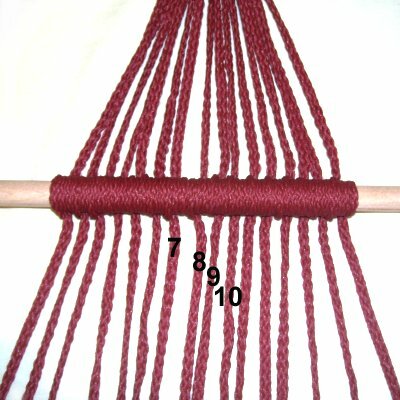 Large Size: Cut 8 cords, each 8 yards long. Cut 2 cords, 36 inches long. Fold the long cords in half and pass them through the small ring, matching the ends. Gather the cords together in a bundle, just below the ring. Step 1: Place a short cord to the left of the bundle. Secure one end near the ring (tail). Bring it down 2 inches, fold it, and move it back up (to the left of the tail). Wrap the end around the bundle of cords, moving right when you first begin. Wrap firmly for 1.5 inches, moving downward towards the folded area. Pass the end through the folded area, which looks like a loop. 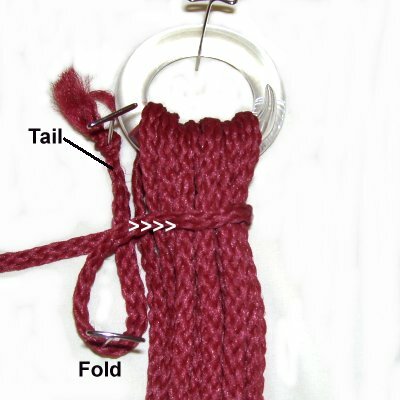 Secure the Wrapped Knot by pulling on the tail, at the top of the knot. The other end will move inside the knot. Pull down on each of the long cords, so they tighten around the ring. Step 1, continued: Apply glue under both ends (inside) and when it's dry, cut off the extra material flush with the edges of the knot. Step 2: Spread the cords and organize them. 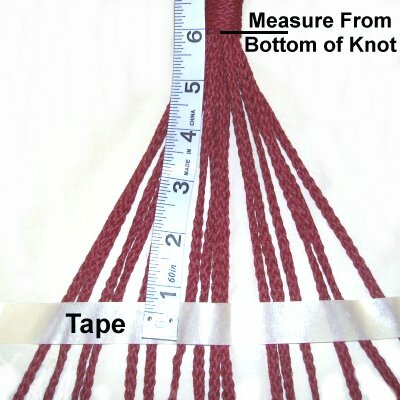 Measure 6 inches down from the bottom of the Wrapped Knot. Apply a piece of tape horizontally across the cords. This is where the dowel for the Diamond Drop Planter will rest. Place the dowel at the lower edge of the tape, on top of the cords. Start with cord 9, in the middle of the group. 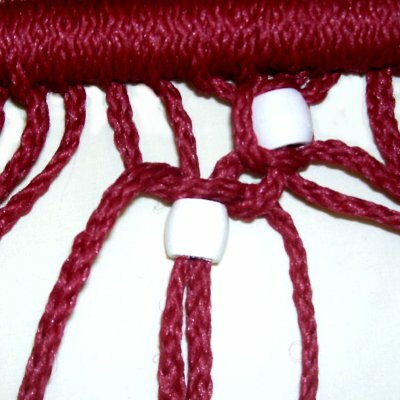 Tie a Half Hitch by moving the end over - under the dowel, and over the cord as you pull it down and to the left. Tie two more knots to the right (Triple Half Hitch). Attach cords 10 - 16 to the dowel in the same manner. Go back to the center and attach cords 8 - 1. 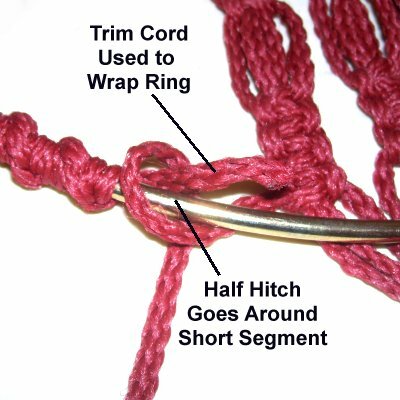 When you make the Half Hitch the end needs to be pulled down towards the right. 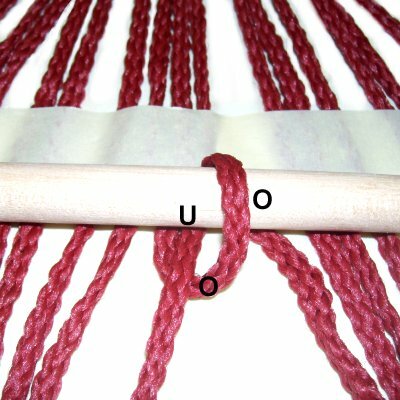 The next two knots are placed to the left of the first. Before moving on, hang up this portion of the Diamond Drop Planter, to verify the dowel hangs evenly. Make adjustments if necessary. Mentally number the cords 1 - 16. 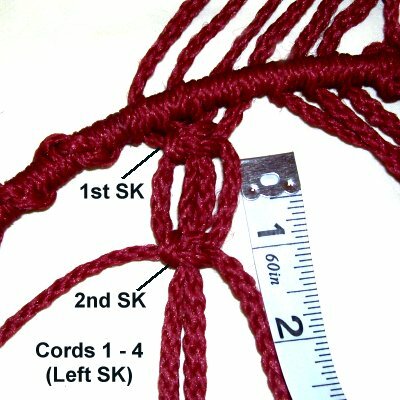 The first Square Knot will be tied with cords 7 and 10. Cords 8 and 9 are the fillers. << Move working cord 7 to the right, over the fillers and under working cord 10. 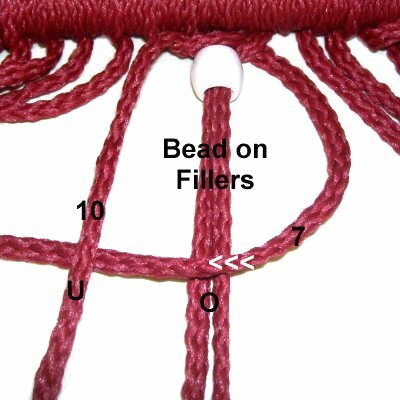 Apply the bead to cords 8 and 9 (fillers). 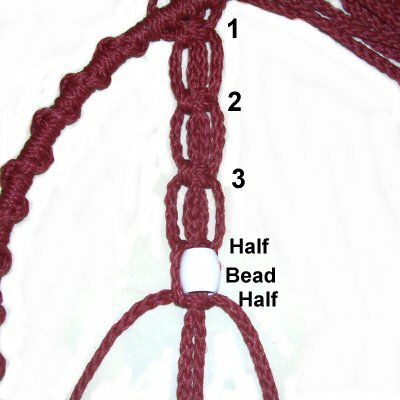 Tie the second half of the knot as shown below. << Move working cord 7 to the left, over the fillers and under working cord 10. << Row 2: Repeat the previous step using cords 5 - 8. Row 3: Repeat step 3, using cords 3 - 6. 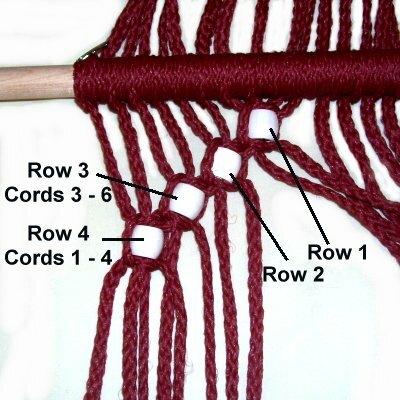 Row 4: Repeat step 3, using cords 1 - 4. << On the right half of the Diamond Drop Planter, always start with the working cord on the right. Row 2 (shown above): Use cords 9 - 12. Row 3: Use cords 11 - 14. Row 4: Use cords 13 - 16. Step 5: Combine cords 5 - 6 on the left with the cords numbered 11 - 12 on the right. 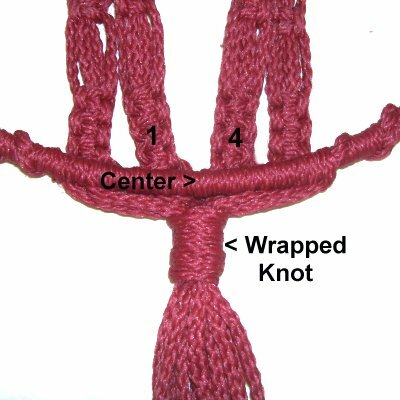 Tie a Square Knot with the four working cords. The fillers are cords 7 - 10. Arrange the cords neatly, so the Diamond Drop Planter has a nice finished appearance. 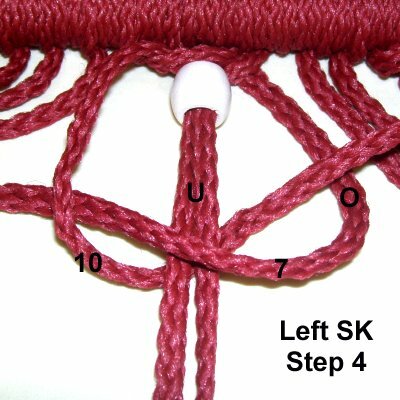 When you tighten the knot, make sure the SK lines up with the beads in the 4th row. Use cords 3 - 6 on the left, tying a left SK. 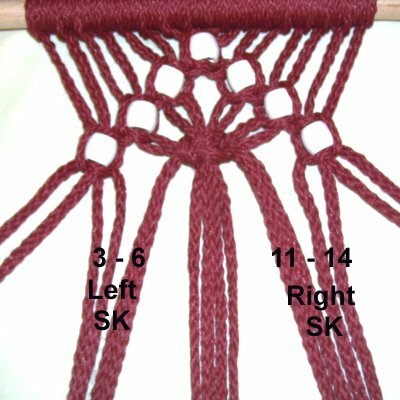 On the right, use cords 11 - 14, tying a right SK. 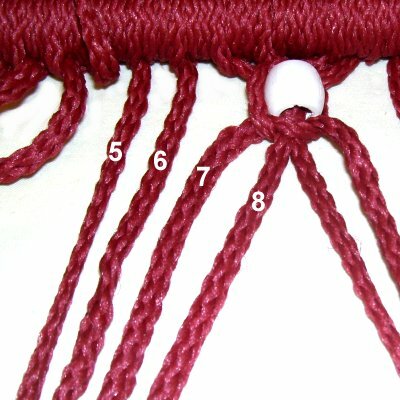 The next row is tied the same as row 2 in steps 3 - 4. On the left, use cords 5 - 8 (left SK). On the right, use cords 9 - 12 (right SK). 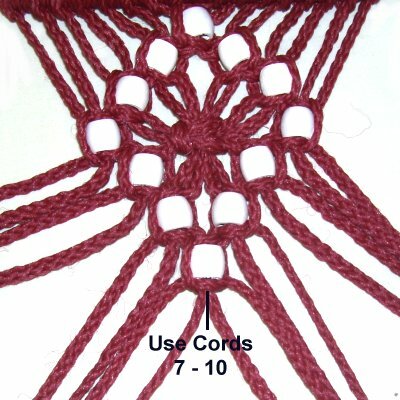 To complete the bead design for the Diamond Drop Planter, use cords 7 - 10, and apply the final bead with a left SK. 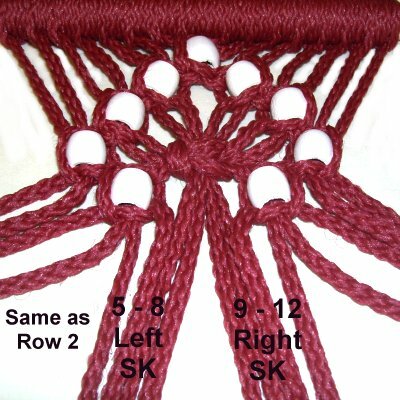 This last bead is considered the first one (row 1) for the next design. Make sure you start with Row 2, and arrange the cords so they are straight. After the final bead is attached to this area of the Diamond Drop Planter, tie the first half of a Left Square Knot. Step 8: Place the large ring on top of the cords, after you arrange them neatly. (See the images and information below). Attach cords 9 - 16, followed by cords 8 - 1 (in that order). 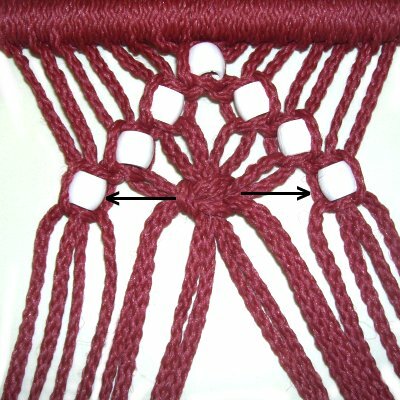 The knots need to change direction, as in step 2 (dowel). Small Size: Attach the cords with Triple Half Hitches. Large Size: Attach the cords with Double Half Hitches. Make sure the segments above the ring are straight with a little tension. This area of the Diamond Drop Planter looks better if the slack is removed. Step 9: Now you will cover the ring with a Spiral design. First, measure straight down from the bead resting at the top center part of the ring. Place a piece of tape on the ring where you measured (bottom center). Small Size: Cut two cords, each 4.5 yards long. 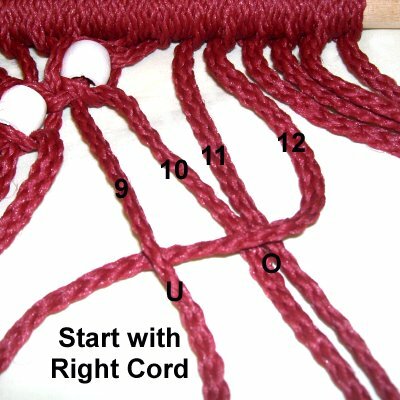 Large Size: Cut two cords, each 5.5 yards long. Secure the new cord to the left of cord 1, at the top of the ring. Keep the knots close to each other. Repeat this process on the right, with the second cord. You need to leave space at the bottom of the ring, to attach the straps. Small size: Leave 1.5 inches to the right and left of the tape (total of 3 inches). Large size: Leave 2 inches on either side of the tape (total of 4 inches). Finish off the short tails at the top of the ring, by sliding them under the back of the Half Hitches next to them. Apply glue. Step 10: Separate the 16 cords into groups of 4. 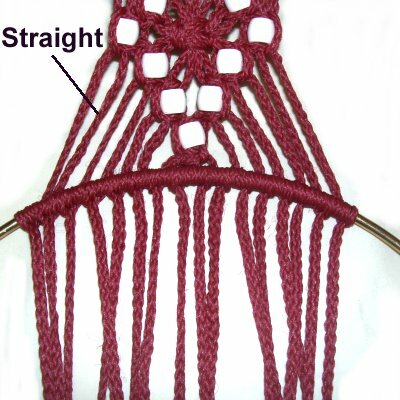 The steps below show you how to make each strap inside the ring of the Diamond Drop Planter. Cords 1 - 4 are shown below, where you will tie left SK. Do the same with cords 5 - 8. 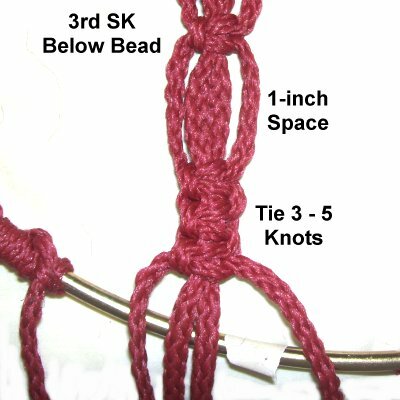 For cords 9 - 12 and 13 - 16, tie right SK. Move down 1-inch, and tie the 2nd SK. Small Size Only: Move down 1-inch and tie a 3rd SK. 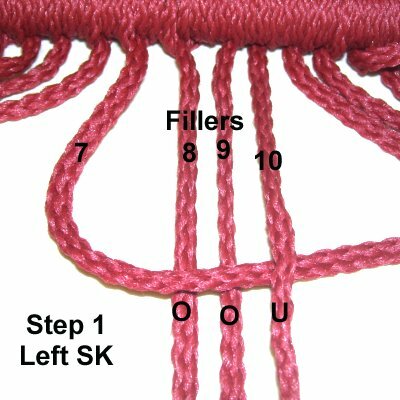 Tie the first half of the SK, add the bead to the fillers, and tie the second half. Step 11: Repeat step 10, tying the same number of SK with 1-inch of space between them. Move down 1-inch and tie 3 - 5 SK. The strap should be very close to the bottom of the ring. 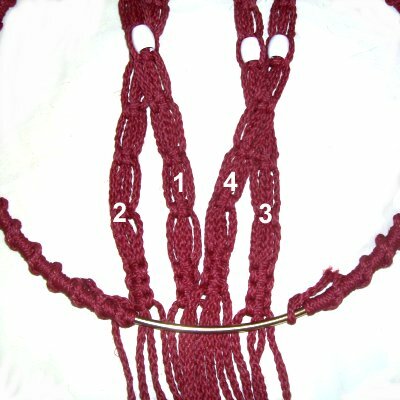 Create the remaining three straps. Step 12: Before securing the straps for the Diamond Drop Planter, verify they are the right size. Place them around the pot you will be using (or one of similar size). The pot should rest on the bottom of the ring, with two straps in front and back. 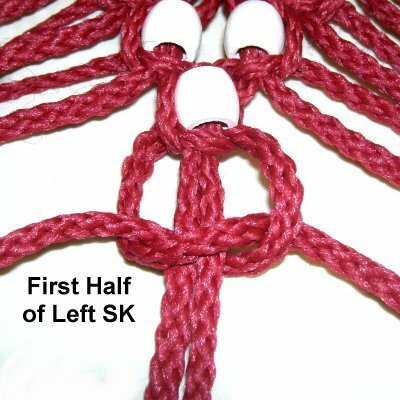 Check to see if the last SK in each strap is close to the ring. Add more knots as needed. 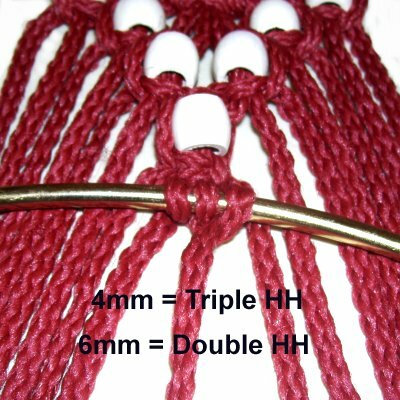 Remember the straps need to be tight enough to hold the pot in place, so don't add too many extra knots. Step 13: Mentally number the four straps. Place them under the lower part of the ring. Arrange them so 1 and 4 cross over 2 and 3, and are next to the tape on the lower ring (center). Remove the tape from the ring. Trim the cords used to wrap the ring to approximately 1.5 inches. Start with strap 2 on the left, and attach each cord to the ring with Double Half Hitches. 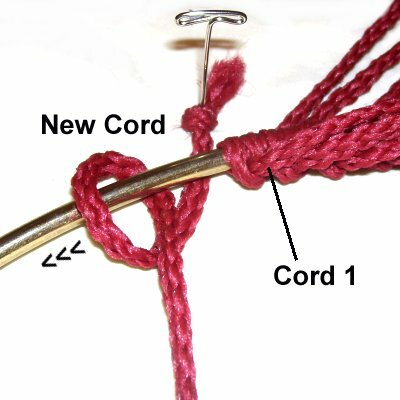 The first few cords need to pass around the 1.5-inch end of the cord used to wrap the ring. Attach the cords from straps 1 and 4, and finish with strap 3. The last 2 cords pass around the short end on the right. Place the pot on the ring, and arrange straps 1 and 4 to the front and sides. Straps 2 and 3 are in the back. Does the pot stay in place? Stretch the straps to see if that helps. 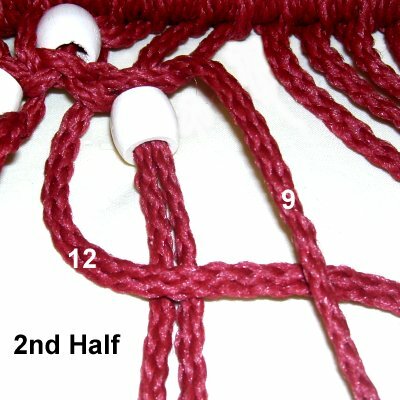 Remove knots and backtrack to step 11 - 12, if you cannot get the pot to stay in place. Step 14: For the small size, use the 30-inch cord. For the large size, use the 36-inch cord. Tie a Wrapped knot around all the cords on the ring, as in step 1. 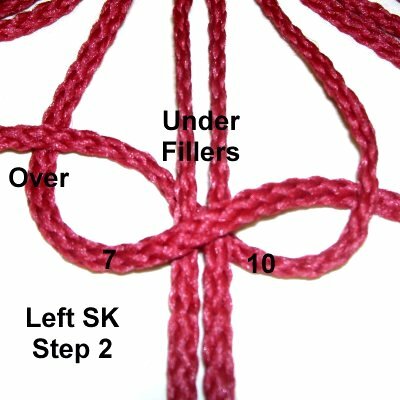 Make sure the knot is lined up with the center; between straps 1 and 4. Step 15: Trim all the ends so they are even. Apply finishing knots, or melt the tips to prevent unraveling. 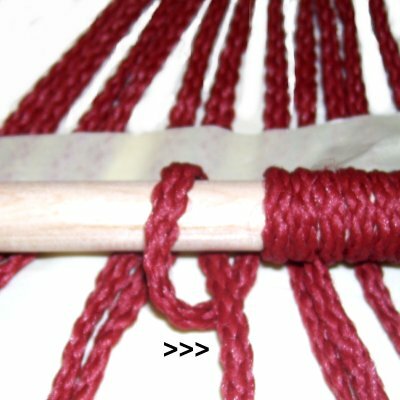 Another option is to unravel each cord, or brush the fibers to make a fluffed fringe. The Diamond Drop Planter can be hung next to a wall, or dangling freely. Have any comments about the Diamond Drop Planter? Contact Me.